You can bid to fish the River Gaula's world-famous Bridge Pool in 2012. Orri Vigfusson’s NASF or North Atlantic Salmon Fund is just that, a fund and it continues to need money to pay off or buy-out the Faroese, Greenland and other north Atlantic salmon nets. Stand aside, then for the seventh auction in support of wild salmon in Norway which takes place in Oslo just a week today and for sheer enjoyment just drool over the photos and fishing in this link. 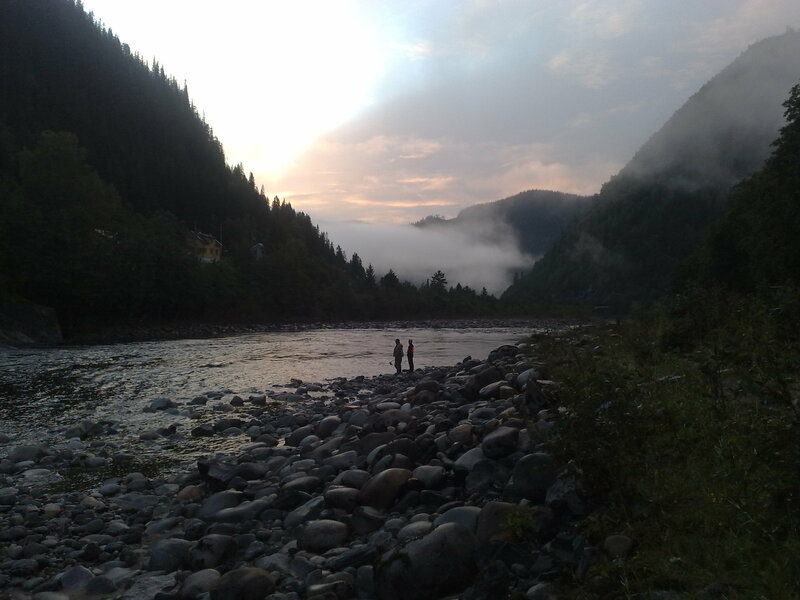 Roxtons have contributed two rods for three days on the big-fish Lakselva river and Manfred Raguse’s Norwegian Flyfishers Club are offering a rod (valued at NOK 26,000) plus accommodation for the prime week of July 15-22 on their superlative fly-fishing beats on the River Gaula. Best wishes to NASF for a great fund-raising event. Hi Henry, Well done on your hard earned Nith salmon matey. One fish makes it all worthwhile. I’ve just been looking at the lots for the NASF auction!!!! I was thinking of bidding for the 2 days on Alta, a mere snip at £17K but fortunately it was a thought that only lasted about 0.5 nanoseconds or maybe a bit less than that. Sad thing is, someone will pay for it and keep the prices up there beyond the reach of mortals. It would be a shame to “blank” at such a venue but I’d imagine that it happens from time to time! I’m looking forward to next week on Tweed. Monday on Nest, Tuesday is Glenormiston and Wednesday on Sunderland Hall. The remainder of the week is on Upper Caberston with the usual Halloween week gang. Apparently there are lots of fish in the river but the water levels have not stabilized for ages, so the fish keep switching on and off which can be a bit frustrating. They will nonetheless get the “dawn til dusk” opportunity to grab my fly, as I’ll be thrashing the water to a frenzy during daylight hours. I’ll let you know how I get on. Best wishes. Craig. Hi Craig – Halloween Week Gang at Caberston? Sounds like a satellite channel horror movie but I’m sure it won’t be and you will manage to connect with some of those silver, or even not so silver scaley monsters. Levels really have been unstable of course so what you need is a few drier days – or some good frosts to slow water flow down. That said of course be careful what you wish for as I’ve prayed for that and by the time I’ve got to the river it’s been a little low and frankly I’ve wanted a bit more rain.. Blimey, salmon fishing eh? I know you will put in the hours but unlike Varzuga you won’t have the hours to play with though I wouldn’t put it past you to fish into darkness this time too! Yes that Alta cost is extraordinary – you could swing getting on for four Varzuga weeks for those two days but there is an additional premium of exclusivity on the Alta of course as you can normally only fish it thro their ‘lottery’ system. I’ll be posting a few more Nith images today, just to taunt those poor bstrds who have to spend today in an office ha ha (I’m really enjoying my new found freedom – going for a run in a minute!) And do take a couple of photos of the Tweed and hopefully email them to me plus a few words – my new email is henry.giles01@yahoo.com by the way – for inclusion on blog and … tight lines on the Tweed (don’t forget the colour red in your flies ie red Allys or red Francis or something like that Calvins shrimp on the link in my post, it’s a top back-end colour), I’m envious. Right, where were my running shoes … ?